So why are we here? To remind the people of the 16 years of cold-hearted neglect suffered at the hands of successive PDP governments. To remind the people that in four years and with fewer resources, President Buhari has created a better foundation for Nigeria’s future than all the PDP governments combined. One Buhari is worth more than the three PDP presidents who preceded him. 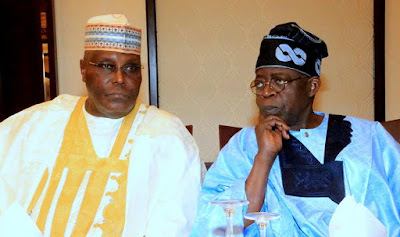 we are entitled to wonder into whose ear does Obasanjo now whisper his support for Atiku’s venal cause? This is what the coming election is about. They claim to be a “reformed PDP” then they select as their candidate Obasanjo’s VP who took the term “privatization” to its literal extreme. Through plotting contrived sales of national assets to himself, Atiku sought to turn half of Nigeria into his own private property. He sought to run off with the goose that laid the golden egg while simultaneously staying put in order to milk dry the national cow. If given a second chance at the national till, he will consume all he did not take the first go around. says the one who owns half of Lagos State! Like you turned all of Lags state choice properties to yours?